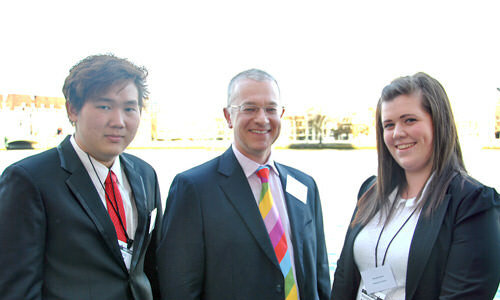 Each year CIFE awards prizes to exceptional students from member colleges. Competition is fierce, so we’re delighted to announce that three CCSS students received CIFE awards this year. Natthawut Adulyanukosol won a CIFE award for Sciences. Natthawut is an outstanding student with a brilliant and enquiring mind. Passionate about science, and biology in particular, Natthawut always wants to explore any subject which captures his interest in more depth, in order to gain a better understanding of it. His many achievements include the Gold Medal from the 22nd International Biology Olympiad, and Gold awards in the 2011 Senior UK Maths Challenge, the 2012 British Biology Olympiad, and the 2012 Chemistry Challenge for the Lower Sixth. He gained 4 A* grades in his A-levels (Biology, Chemistry, Mathematics, and Further Mathematics), and is now studying Natural Sciences at St. John’s College Cambridge. Tanut Treetanthiploet, pictured below with CCSS Principal Stuart Nicholson and fellow prize-winner Hannah Smart, won a CIFE Andrew Osmond Maths award. Tanut is quite simply a phenomenal mathematician. His mathematical talent was clear from the first week he joined CCSS, where in one year, he quickly and effortlessly worked his way through all of the mathematics modules, usually taken in two years, in addition to extra statistics, which he studied independently, and STEP. His achievements include an award at the 18th International Conference of Young Scientists, where he represented Thailand on the basis of a remarkable mathematics project he carried out as a teenager, numerous awards from mathematics competitions, and a Gold award in the 2011 UK Senior Maths Challenge. He gained four A* grades in his A-levels (Mathematics, Further Mathematics, Statistics and Physics), distinctions in STEP I, II, and III, has a Mathematics Advanced Extension Award, and is now studying Mathematics at King’s College Cambridge. Hannah Smart gained a CIFE College Award. Hannah immediately impressed us when she joined CCSS – not only as a hardworking, focused and determined individual but also as her personal circumstances were not easy due to family illness. Hannah demonstrated a natural aptitude for Law, a real appetite for knowledge and a superb work ethic and was a very likeable and engaged student. She was very proactive in seeking out work experience with a local solicitor and a placement shadowing a criminal barrister; as well as regularly attending local Magistrate and Crown courts to witness full trials and hearings. She achieved an A* in Law and A grades in Politics and History securing a place to study Law with American Law at the University of East Anglia.